← Killing workers: business and consumption as usual? One witness from the party said people paid $15 to 20 to get into the party. 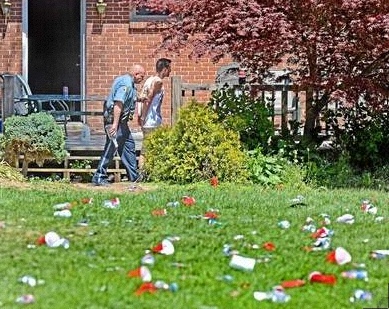 The witness said the party-goers “felt robbed” because the police arrived before 1 p.m. and told them to leave the area. According to some people at the South Walnut Street party scene, a $5 cover is usually required for entry to a party or red Solo cup for beer. The larger fee was considered expensive but the attraction was the promise of an all-afternoon party. According to the Action News report, the victim had paid a $15 admission fee to get into the party…. Other reports and editorials mentioned various offenses and causes for the arrest of two or three, but none that I have seen mention selling alcohol without a license. Investigations of unlicensed establishments, commonly referred to as “speakeasies,” are investigations to determine if sales of liquor, alcohol, or malt or brewed beverages are occurring without a license being issued to do so by the Pennsylvania Liquor Control Board. After establishing probable cause of the illegal sale of alcoholic beverages, seizure and criminal proceedings may be initiated. Unlawful sales of liquor, alcohol or malt or brewed beverages occur when a license is not issued by the Pennsylvania Liquor Control Board and a monetary condition is requested in order to obtain liquor, alcohol or malt or brewed beverages. Examples of unlawful sales are as follows: A ticket price that includes food, entertainment, and liquor, alcohol or malt or brewed beverages; an event where an entrance fee (monetary payment) must be made in order to obtain liquor, alcohol or malt or brewed beverages. A person who sells or offers to sell any liquor or malt or brewed beverage without being licensed is in violation of sales without a license (PA Liquor Code Title 47, Sections 491.1, 492.2, and 492.3) and shall, in addition to any other penalty prescribed by law, be sentenced to pay a fine of two dollars ($2.00) per fluid ounce for each container of malt or brewed beverages and four dollars ($4.00) per fluid ounce for each container of wine or liquor found on the premises where the sale was made or attempted. The amount of fine per container will be based upon the capacity of the container when full, whether or not it is full at the time of the sale or attempted sale. In addition, all malt or brewed beverages, wine and liquor found on the premises shall be confiscated. If a person fails to pay the full amount of the fine levied, the premises on which the malt or brewed beverages, wine or liquor was found shall be subject to a lien in the amount of the unpaid fine if the premises are owned by the person against whom the fine was levied or by any other person who had knowledge of the proscribed activity. It seems, from the Daily Local’s report and from many comments over the years, that being charged an entrance fee to consume alcohol at parties is a regular occurrence in the Borough. …alcoholic beverages were made available to adults and those under the age of 21 years old for an entrance fee. At $2 per ounce of beer capacity, the penalty could mount up, if the police save all containers in which alcohol was served, but that’s only money; I would have thought, especially in a state that controls the sale of alcohol, selling alcohol without a license would involve further penalties, like jail time. Any person who shall violate any of the provisions of this article, or who shall engage in any fraud or fraudulent practice, as defined herein, shall be guilty of a misdemeanor and, upon conviction thereof, shall be sentenced to pay the costs of prosecution and a fine of not less than one thousand dollars ($ 1000), nor more than five thousand dollars ($ 5000), or undergo imprisonment of not less than one year, nor more than five years, or both, at the discretion of the court. Perhaps some educating of students and others by the University and Borough on the consequences of charging admission to parties where alcohol is served would be in order? Nathaniel regards himself as a progressive Democrat who sees a serious need to involve more Americans in the political process if we are to rise to Ben Franklin's challenge "A republic, madam, if you can keep it," after a passerby asked him what form of government the founders had chosen. This blog gives my views and background information on the local, state, and national political scenes. My career in higher education was mainly in the areas of international studies, foreign languages, and student advising, most recently at Franklin & Marshall College in Lancaster, from which I retired in 2006. I have lived in West Chester since 1986. This entry was posted in Crime and tagged alcohol, beer, selling alcohol without a license, West Chester. Bookmark the permalink. What about the restaurants around town like Tsunami that serve free sake “on the house” without license, even to minors?